Leading Wholesale Distributor of 324 high impact speed bonder, 406 prism instant adhesive, 401 prism instant adhesive and 415 super bonder instant adhesive from Pune. 324 High Impact Speed Bonder requires no mixing or other addition prior to the application. 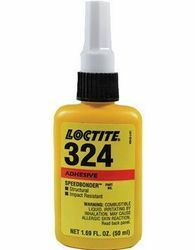 This high impact, toughened, two step acrylic, amber, multi-surface Loctite® 324™ Speed bonder™ structural adhesive offers the strength of an epoxy and the speed of an instant, fixture in 5 minutes. 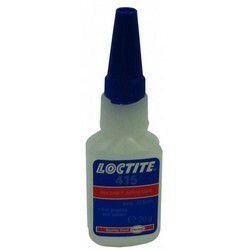 Solvent resistant, this adhesive when used with Loctite Primer 7075™ becomes ideal for large gap applications. We are renowned in the industry for supplying best quality range of 406 Prism Instant Adhesive, which is asurface insensitive, one part, room temperature cure, instant adhesive. Specifically formulated using accurate composition of pure compounds, these are ideal for bonding plastics and elastomer materials. 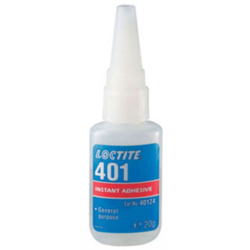 Complying industry laid standards, these Loctite ® 406™ Prism ® Wicking grade adhesives are used in places where very fast fixturing is required. Our organization is engaged in procuring and supplying a world class range of 401 Prism Instant Adhesive that has surface insensitive, low / medium viscosity and clear appearance. This one part, room temperature cure, instant adhesive, is formulated for OEM assembly of difficult-to-bond materials which require uniform stress distribution. An ideal solution for close fitting applications, these are suitable for bonding a wide range of materials, including metals, plastics, and elastomer. We are a reputed name in the industry widely appreciated for bringing forth the clients a wide range of 415 Super Bonder Instant Adhesives. Ideally applicable for filling the gaps between the bondings of the substances, the range is strictly developed in tandem with the international quality standards. Also, the range is widely appreciated by the clients for its consistency, excellent bonding strength, accurate compositions, stability, reliability and longer functional life. 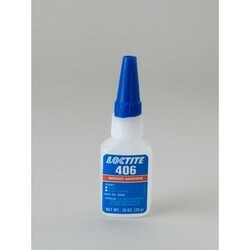 Looking for Henkel Loctite General Purpose Bonding ?